Connectors are the heart and soul of Federated Search (FS) engines and with the rise in importance of FS in today’s fast paced, Big Data, analyze everything world, they are crucial to smooth and efficient data virtualization and flow. 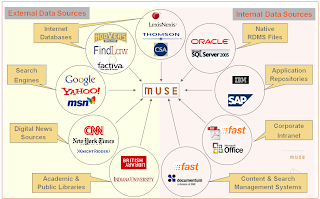 MuseGlobal has been building Connectors, and the architecture to use them (the Muse/ICE platform) and maintain and support them (the Muse Source Factory) for over 12 years. The people who design and build Connectors must be both computer savvy, and also have a deep understanding of data and information and its myriad formulations. All of this speaks to the volume and velocity (of change) of the data – two of the trio of defining “v”s of Big Data. The third v is variety and this is now encompassing much more than the internal data silos of the enterprise. Increasingly decisions need to take account of the outside world: competitors, news media, commentators and analysts, customer feedback, social postings and tweets. Most of these sources are also fleeting. Customer records will last for years, a tweet is gone in 9 days. Even product reviews are only relevant until the next version of the product is released. And there are another couple of additional hurdles to jump to get this valuable “perspective” data. This data lives outside the enterprise. Some other person or organization has control of it. And that means the old ETL trick of grabbing everything is likely to be severely frowned on – especially if it is tried every night. Commercial considerations mean that, if this data is valuable to you, then it is valuable to others, and the owners will not let you have it all for free. This means the strategy of asking for exactly what is needed is the way to go. It takes less time everywhere, will cost less in processing and transmission, will cost less in data license fees, and will not alienate valuable data sources. So “sipping gently” is the way to go. Yes, in the paragraph above you saw “fees” mentioned. Once the commercial details have been sorted out, there is still the tricky technical matter of getting access through the paywall to the data you need, and are entitled to. Some services will provide some of the data you want for free, but most will require authenticated access even of there is no charge Those who are selling their data will certainly want to know that you are a legitimate user, and be sure you are getting what you have paid for – and no more. For both of these considerations Federated Search engines, especially in their harvesting mode allow all the “virtual data” to become yours when you need it. Access control is one of the mainstays of the better FS systems to ensure just this fair use of data. And gentle sipping for just the required data is their whole purpose. Again a tool for the task arises. MuseGlobal runs a Content Partner Program to ensure we deal fairly and accurately with the data we retrieve from the thousands of sources we can connect to, both technically and as a matter of respecting the contractual relationship between the provider and consumer. We are the Switzerland of data access – totally neutral and scrupulously fair, and secure. So now you are accessing internal and external data for your BI reports. Unfortunately, while you might have a nice clean Master Data Managed situation in your company, it is not the one the external data sources are using (not unless you are Walmart or GM and can impose your will on your suppliers, that is). And this means the analysis will be pretty bad unless you can get internal product codes to match to popular names in posts and tweets. There is a world of semantic hurt lurking here. You need tools. Fortunately the Federated Search engine you are now employing to gather your virtual data is able to help. Data re-formatting, field level semantics, content level semantics, controlled ontologies, normalized forms, content merging and de-merging, enumeration, duplicate control, all these are tools within the FS system. 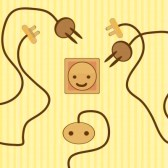 They are powerful tools and they are very precise, and they come with a health warning: “This Connector is for use with this source only”. Connectors are built, and maintained, very specifically for a single Target. They know all about that target, from its communications protocol to the abbreviations it uses in the data. Thus they produce the deepest possible data extraction possible. And can deliver that data in a consistent format suited to the Data Model and systems which are going to use it. They are data transformers extraordinaire. This contrasts with crawlers at the other end of the scale where the aim is to get a simple sufficiency of data to handle keyword indexing. This precision means that they are in need of “tuning” whenever their target changes in some way. Major changes like access protocols are rare, but a website changing the layout of its reviews is common and frequent. Complexity like this is handled by a “tools infrastructure” for the FS engine whereby testing, modification, testing again, and deployment are highly automated actions, reducing the human input to the problem solving, not the rote. And now another wrinkle: some of the data needed for the analysis is not contained in the records you retrieve, and the only way to determine this is to examine those records and then go and get it. As a simple example think of a tweet which references a blog post. The tweet has the link, but not the content of the post. For a meaningful analysis, you need that original post. Fortunately the better FS systems have a feature called enhancement which allows for just this possibility. It allows the system to build completely virtual records from the content of others. Think more deeply of a hospital patient record. This will have administrative details, but no financial data, no medical history notes, not results of blood tests, no scans, no operation reports, no list of past and current drugs. And even if you gather all this, the list of drugs will not include their interactions, so there could be more digging to do. A properly configured and authenticated FS system will deliver this complete record. Analysis these days is more than just a list of what people said about your product. It involves demographics and sentiment, and timeliness and location. All these can come from a good analysis engine – if it has the raw data to work from. Enhanced virtual records from a wide spectrum of sources will give a lot, but making the connections may not be that simple. We mentioned above “official” and popular product names and the need to reconcile them. Think for a moment of drug names. Fortunately a good FS system can do a lot of this thinking for you, and your analytics engine. Extraction of entities by mining the unstructured text of reviews and posts and news article and scientific literature allows them to be tagged so that the analysis recognizes the sameness of them. Good FS engines will allow this to a degree. Better ones will also allow that a specialist text miner can be incorporated in the workflow and give each record its special treatment – all invisibly to the BI system asking for the data. There is a lot of data out there, and a great deal of it is probably very useful to you and your company. Using the correct analysis engines and Federated Search “feeding” tools enables that data to be brought together in a flexible, efficient, and accurate manner to give the information needed for informed decisions. Federated Search is still a very powerful and effective way to search for humans, but it has grown up to be one of the most effective tools for systems integration, the breaking down of corporate silos of data, and the incorporation of data from the whole Internet into a unified, useable data set to create real knowledge. Muse is one of those tools which can supply the complete range from end user fed search portals, to embedded data virtualization, and we intend to keep up with the next turn of data events. Today's eWeek online version, 2012-02-20, contains a story, Cloud Computing and Data Integration: 10 Trends to Watch, within its "Cloud" section seemingly written around the capabilities of Muse. Or, perhaps MuseGlobal has been developing capabilities within its flagship software platform which fit the "waves of the future" now starting to break on the shore of today's business needs. Increasingly, large organizations are discovering and using enterprise information with the objective of growing or transforming their business as they seek more holistic approaches to their data integration and data management practices. This is all in an effort to address the challenges associated with the growing volume, variety, velocity and complexity of information. ... intensifying expectations for cloud data integration and data management as a part of a company's information infrastructure. ... to enable a more agile, quicker and more cost-effective response to business needs. ...eWEEK spoke to Robert Fox, of Liaison Technologies. So what are the trends (details in the eWeek article)? And how does Muse fit in those trends? Muse provides a cloud based service enabling standards based systems and those with proprietary messaging protocols to communicate with each other. This is a hub-and-spoke architecture, so once an application has its Connector written, it can communicate with ALL the other applications working with that Muse hub. Not so obvious here, but Muse has Connectors for access to the major, and quite a few minor, social platforms, so including their information and practices in the B2B world should be that much easier. Where service providers gather information and data from disparate sources, merge it, de-dupe it, cleanse it, and hand it on the service user, Muse is an obvious platform with all of these capabilities baked in from the first batch. Increasing numbers of data providers and the rise of the data brokers, means Muse has a niche as the functional platform for these new providers. "Integration platform as a service (iPaaS) allows companies to create data transformation and translation in the cloud ..." I couldn't have put it closer to the core of what Muse does, if I had said it myself! Aggregation, de-duplication, transformation, normalization, conformance to standards (local and International), consistency, identification of differences, enrichment, delivery – this could again be a description of a Muse harvesting service. Right here when needed. Not directly a Muse function, but its transaction and processing logs make provenance and quality of data easier to report on and find the areas of weakness. Secure communications, a sophisticated range of authentication options, encryption when needed, and NO intermediate storage of the data means that Muse as a transaction service is not the weak security link in the chain. Not a core strength of Muse – can't win them all. But complex data manipulation processes can be handled through scripting within Muse. Connection to and from external service platforms means that they can be allowed to control the modeling and allow Muse to deal with the data. Tie Muse's aggregation and data cleansing to a link with your favorite BI service and monitoring became rather easier. Because Muse links to systems, it will work with virtually any BI system and place the raw data and analyses wherever they are needed for review. If this sounds like your business (or one you want to get into), then a look at the Muse platform could save a lot of time and effort to get a superior service up and running. As the technology behind a CSB it takes some beating! So how did Muse do? Seven right on the money and three near misses seems like a pretty high score to us. Will Hybrid Search get you better mileage? The recent news of the acquisition of Endeca by Oracle has triggered a number of research notes by analysts. In particular Sue Feldman of IDC talked of the rise of a Hybrid Search architecture. What is it? Is it good for you? Should you have one? And where does MuseGlobal stand? These definitions acknowledge the growing importance of information from everywhere, in unstructured as well as structured form, and the need to be able to access and analyze it in the modern enterprise. Information can, and does, come from anywhere – internal CRM systems, company independent blogs and forums, totally differentiated social media such as blogs and tweets, competitor websites, news services, and even raw data repositories. And it comes in the form of database records, blogs, emails, tweets, images and more. In the modern enterprise the need is to be able to analyze and use all this information immediately and easily. Mining information from these disparate sources is not something that business analysts or product managers should be spending their time on. They need a reliable supply of the information where the semantics can be trusted, the information is up-to-date, and where the analyses can be set up easily. This is where the “plumbing” comes in. Two stages are involved: gathering the information, analyzing the information, then the user can take action on the intelligence provided. Companies like MuseGlobal take care of the first stage, and repository and BI companies take care of the second. What this means is that your organization sets up a Muse harvesting and/or Federated Search system once, pointing to the desired Sources of data, configures authentication where needed, and determines how the results are to be delivered to the analysis engine, specifying a choice of standards based or proprietary protocols and formats. Adding new Sources (or removing unwanted ones) is a point and click operation, and the Muse Automatic Source Update mechanism (and our programmers and analysts) ensures the connections remain working even when the sources change their characteristics – or even their address! About as close to “set and forget” as you can get in this changing world. On schedule, or when requested by users, the data pours out of Muse in a consistent standardized format, with normalized semantics and even added enrichments and extracted “entities” or “facets” (Endeca’s terminology) and heads to the next stage of the information stack. This raw and analysed data input means the BI system (or whatever is in use) can now deliver more comprehensive analyses so staff can now concentrate on the information they have in front of them, not on seeking it in bits and pieces from all over the place. And the information is not only from many sources, it is in varied formats. Forrester have just released a report which asks the questions “Have you noticed how search engine results pages are now filled with YouTube videos, images, and rich media links? Every day, the search experience is becoming more and more display-like, meaning marketers must align their search and display marketing strategies and tactics.” So the need to handle a complete range of media types and convoluted structures is becoming paramount or the received data will be just the small amount of text left over from the rich feast of the retrieved results. This is a topic for another blog, but suffice it to say that Muse can deliver the videos as well as the text. Hewlett-Packard announced on August 18th an agreement to purchase Autonomy. Autonomy has moved beyond its original enterprise search capabilities by utilizing its IDOL (Integrated Data Operating Layer) as the forward looking platform to provide an information bus to integrate other activities. It now handles content management, analytics, and disparate connectors, as well as advanced searching, to provide users access to data gathered from multiple sources and fitting to their needs. It has also moved aggressively to the cloud and currently nearly 2/3 of its sales are for cloud services. Although Autonomy will bring significant revenue and a large cloud footprint to HP, the major imagined benefit is seem in its ability to aggregate, normalize, analyze and distribute information across an enterprise. This is an area where MuseGlobal’s Muse system with its ICE “bus” provides a very similar set of functionality with its Connectors (6,000+ and growing), Data Model and semantically aware record conversion, and entity extraction analysis, providing similar functionality – if not content management or enterprise search. Muse is also very strong in record enrichment so that virtual records can be provided both ad hoc and on a regular “harvested” basis to connected processing systems – such as content management or enterprise search. Various commentators suggest that this move may “encourage” the other big players who HP competes against to have a look at acquisitions of their own. OpenText is the most noted possibility, though Endeca and Vivisimo get a mention. MuseGlobal is certainly in the same functional ballpark providing functionality for enterprises, universities, libraries, public safety, and news media.